Organiser Brian Lazenby said that the results had been very gratifying and that many of those participating had put in extra effort to exceed the target of £100. One outlet, The Three Horse Shoes, East Worldham add even added money from other activities to swell the amount taken. Moira Howells, President of Alton Lions, called in at Bushy Leaze to present the cheque. Receiving the cheque on behalf of the Head of Centre, Jane Heath expressed her gratitude to all who had supported the fund raising effort and said it was gratifying to know that there was so much good feeling and support in the community for the centre. She said that the money was very welcome as there were plans to increase the work done by the centre. The plan was to extend the hours of opening and introduce new initiatives to give more children opportunities for more enriching experiences. She said that as any extra service only came at a cost it was important to be able to gain more income and that efforts like that made by Alton lions and supported by the public helped to make this possible. Winners were: Alton Golf Club, Fraser Davis; Alton Herald, Linda Powell; Alton Sports Centre, Catherine Parisi; Bushey Leaze Centre, Thomas Evans; Castle of Comfort, Leslie Browning; Community Centre, Marinda Thompson-Webb; Cricketers Inn, Carole Pearson; Energique Fitness Club, Jenny Ramsay; Gilroy and Brookes, Paul Reeves; Kings Head, Chloe Starr; Kingsley Tennis Club, T. Forbes; Rehab Shop, Sue Bacon; Railway Hotel, Freya Huddleston; Ropley Village Shop, Stephen Broadbent; Rose & Crown (Farringdon), Jackie Rhodes; Royal Oak (Lasham), Gerry Bartlett; Selborne Arms, Harry Wodehouse; Star (Bentworth), Shana Williams; Three Horse Shoes, Roger & Jenny; Wheatsheaf, Graham; White Hart, Tony & Jo; Windmill Inn, Mark Ryan; Worldham Golf Club, Gordon Hunt. 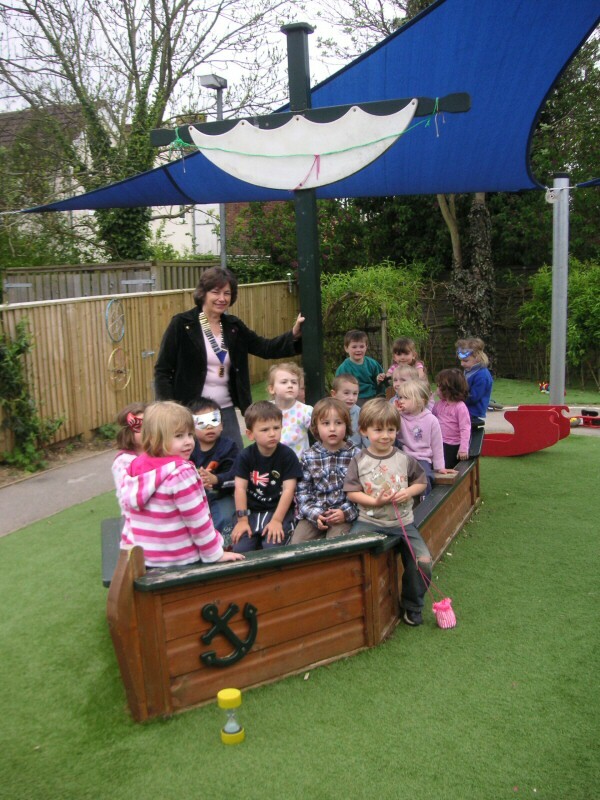 Lion President and the children of Bushy Leaze sail off to a bright future.